Start your morning. There is never a rush. We at Meadowlark feel that if you are in a hurry you may be in the wrong place. Watch for the sun to rise over the mountain greeting the day. Take a morning swim in the heated mineral water pool and/or a dip in the hot tub before breakfast. 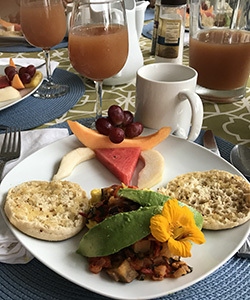 A delicious gourmet breakfast is awaiting you prepared with organic ingredients from the local farmers market, our garden, our fruit trees, and fresh healthy eggs from free-range organically-fed chickens, free of pesticies, hormones or antibiotics, all complimented by freshly baked items. 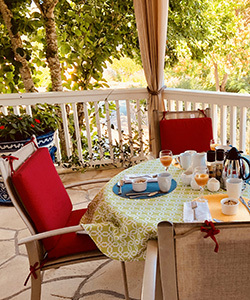 The pleasant cool of the summer mornings will invite you to enjoy your breakfast on the large veranda where you are surrounded with views to nature. During the winter months the fireplace in the living room-library will enhance a feeling of coziness. 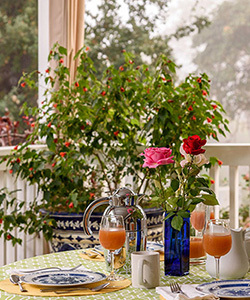 You can also have your breakfast served in the privacy of your room or anywhere you prefer to be. We are very relaxed and enjoy being accommodating. 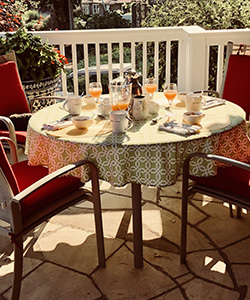 Your experienced hosts are happy to help plan an itinerary visiting world famous wineries, fine restaurants, shopping, art and cultural events, places of interest, ballooning, golf, tennis, cycling, hiking, limo service or any other activities. We at Meadowlark are looking forward to welcoming you and providing you with a memorable experience worth repeating. Happy return guests are our friends.